A Psychologist On How To Argue As A Couple In Business Together - COUPLECO. What causes you to argue vehemently when you’re actually in agreement? What happens when an argument just makes you shut down? Why is walking away from an argument sometimes the right way to deal with it? Dr. Rachna Jain is a licensed clinical psychologist. Two years ago, she launched a relationship program specifically for entrepreneurs to help them navigate their relationships and keep them strong and healthy while growing their businesses. In this episode she talks to us about arguing: Why arguing is important, why people react differently in arguments, and strategies to get through a disagreement. Do you want to be right—or do you want to be in the relationship? Blaine: 00:01 It helps if I push the record button. Honey: 00:06 So we are now recording. Blaine: 00:11 Does that look like it's recording to you? Honey: 00:12 Well, I'm not the tech person, but little lines are moving, so I'm going to call it a yes. Blaine: 00:17 Little lines are moving. That sounds like a metaphor. Honey: 00:20 Or a book title. Blaine: 00:21 It doesn't sound like a book title. Honey: 00:23 Well, waiting in the gate. Blaine: 00:25 How to Argue with your Spouse for Fun and Profit. Honey: 00:29 It's never fun. Blaine: 00:32 Welcome to CoupleCo, Working with your Spouse for Fun and Profit. Honey: 00:35 It's business and it's personal. Blaine: 00:36 I'm Blaine Parker. Honey: 00:37 Which makes me Honey Parker. Blaine: 00:39 And as a couple in business together, we are coming to you from the Couple Coach, our compact, trans-American land yacht. Honey: 00:44 We're navigating the nation in search of standout couples in business together. Blaine: 00:48 And are bringing the view so you can hear their inspiring stories of crushing it in business without crushing each other. Honey: 00:53 The show is also brought to you by a couple-owned business. Blaine: 00:56 Smokin' Mary Smoked Bloody Mary mix. Honey: 00:58 Made in small batches with no reconstituted tomato juice, only wonderfully fresh, tremendously whole, completely fantastic tomatoes. Blaine: 01:10 And a bushel basket of adverbs to boot. Smokin' Mary's smoked Bloody Mary mix. Hey, nice tomatoes. Online at smokinmary.com. If you're in business with or want to be in business with your better half, you probably have questions or challenges or even issues. Blaine: 01:28 Oh, the dreaded issue. Honey: 01:29 If you'd like to hear those things addressed here on the show, just send an email to CoupleUp@CoupleCo.com. Blaine: 01:35 Your input will help determine the direction of future episode. Honey: 01:38 And we will, of course, mention you right here on this show and help you become world famous. Blaine: 01:45 You might even become big in Bangladesh just like this show. Honey: 01:49 We're big in Bangladesh? Blaine: 01:51 Second-biggest listenership after the US. They beat out the Canadians by a wide margin. Honey: 01:56 Hmm. Come on, Canadians. Send us your emails. We'll make you big in Bangladesh. Blaine: 02:02 Good. Just what every Canadian wants. Today, we are returning to the psychologist's couch with our favorite head-shrinker, Dr. Rachna Jain of InLoveAndBiz.com. Honey: 02:15 Today's show is all about throwing your arms up in the air and being dramatic. Blaine: 02:19 You betcha. This is CoupleCo, the argument addition. Honey: 02:24 So what causes the two of you to argue vehemently when you're actually in agreement? Blaine: 02:29 What happens when an argument just makes you shut down? There's an actual name for this. Honey: 02:33 We'll hear about the different styles of arguing. Blaine: 02:36 Including the fact-based arguer, the feelings-based arguer, and even the kitchen-sink arguer and what to do about it, including a technique that's deceptively simple to implement yet makes it surprisingly difficult to maintain your argumentative stance. Honey: 02:50 We'll hear about when walking away from an argument is not only okay but absolutely necessary. Blaine: 02:56 And we'll get to experience the phrase, "hormonal cascades." Here now, CoupleCo, the argument edition with Dr. Rachna Jain of InLoveAndBiz.com. We are back again with the fabulous Dr. Rachna Jain of Profitable Popularity and InLoveAndBiz.com. Blaine: 03:23 Okay, just for people who have not heard you before, please give us a quick recap of all those fabulous credentials that you have got. Dr. Jain: 03:31 Okay. Ready? Go. Blaine: 03:31 Can you do it? Blaine: 03:35 You're going to be graded. Dr. Jain: 03:36 I'm a licensed psychologist. I have clinical specializations in couples and marital therapy and neuropsychology. I have been working online since 1998. I have helped lots of clients build their online businesses, and I use psychology in the marketing work that I do. About two years ago, I started a relationship coaching program for entrepreneurs, and that focuses on helping entrepreneurs navigate their relationships and how to keep them strong and healthy while growing their businesses. And I've known Blaine and Honey for I think eight or nine or ten years, we decided. Blaine: 04:12 Maybe even longer. Dr. Jain: 04:13 Maybe even longer. Honey: 04:13 I mean, what was crazy is we had reached out because we know Rachna for years as a specialist in clinical psychology. We did not know that she was doing work with couples, but we were interested in talking to her about that. And she said, "By the way, check out my website." Blaine: 04:34 Talk about serendipity. So what that has done is brought us together in what is going to promise to be a brilliant series of interviews shedding light on how the heck we do this thing called CoupleCo. Honey: 04:55 People have called themselves couple cos, which I love. Dr. Jain: 04:58 Absolutely. Yeah. Blaine: 04:58 Yes. "We're a couple co." It's like, "Wow. This is cool." Honey: 05:02 It makes me very happy. Blaine: 05:05 Oh, by the way, do you have a screenshot of that 1998 website? Blaine: 05:11 I want to see that. Frames? Dr. Jain: 05:14 Frames. Yeah, I had frames, yes. It only had one page. Blaine: 05:17 No, we're not. Honey: 05:22 You're right. This is just something that keeps coming up. Blaine: 05:25 No, it doesn't. Honey: 05:27 You are good at that. Dr. Jain: 05:29 Wait. Let me guess. Conflict? Blaine: 05:33 ... how to argue. Honey: 05:33 No, it's not. Honey: 06:00 That's Matt and Rebekah Titus. Blaine: 06:02 ... But they never argued at all, ever. They had a storybook marriage, and then they decided to go in business together. Dr. Jain: 06:02 Business together. Honey: 06:11 Yeah. She said she was so taken aback because they didn't argue about anything, and then they did. Blaine: 06:18 Then they did. Yes. So what? How? Arguing. It's going to happen, right? Dr. Jain: 06:24 Yes, it absolutely is going to happen. Honey: 06:26 We did have one couple who said they do not argue at all. Blaine: 06:30 And we had another couple say, "BS." Honey: 06:32 "I don't believe them." Honey: 06:35 We're not naming names on that one. But is it necessary? Is arguing necessary? Dr. Jain: 06:40 I don't think arguing is necessary, but let's actually back up a few steps and just call it differences of opinion. Dr. Jain: 06:46 You will have those for sure. And if your style is to confront those and to be confrontational or adversarial to each other, you will have arguments. If that's not your style because you don't do that, then you will have differences of opinion, which are still going to look like arguments to someone else, but you may not call them that. So I think there's a bit of a semantic difference in what people are talking about. And I think when people consider arguments, they're often considering that raised voices and that escalation and that slamming doors and, "I'm not talking to you," and just that kind of thing. But you can have plenty of disagreements or differences of opinion that are a lot quieter, a lot colder, and maybe in some ways a lot more long lasting. So I think it's important to recognize that you will be called upon to try and address your differences, and even if you have a storybook marriage, very rarely does business go that way. Very rarely do we have storybook businesses. Blaine: 07:47 So is arguing necessarily a bad thing? Dr. Jain: 07:54 ... disagreeing. I think disagreeing is really important because it shows you the places that either you have to have more discussion or you need to put some rule or boundary in about. It gives you an opportunity to try and resolve it or make it better, and I think in some ways the faster and sooner you can do that in the course of in a business or a relationship, it lays a stronger foundation for the future. Honey: 08:19 Right. I mean, certainly something that's come up repeatedly is you cannot be afraid to talk to the other person about something. Fear of confrontation, fear of disagreeing, what's that going to lead to? I mean, you have to be able to put it on the table. Blaine: 08:37 I'm thinking right now to something that happened recently. We did an interview with Wayward Owl Brewing Company in New Orleans, Louisiana, and Justin and Kristin, they're amazing people. I mean, I don't think I've ever met anyone, not just in the context of CoupleCo, but anyone, anyone who works on their relationship like this and seems to be more acutely aware of what's going on. But one of the problems that they have is they argue. And Honey and I have done this, too. Honey: 09:06 Argue? When was that? Blaine: 09:08 We don't argue. Sorry. I forgot. They argue, and they realize as they're going through this argument, they are on the same side. Dr. Jain: 09:18 Yes. Very common. Honey: 09:22 The [Aldes 00:09:22] have said that. We've absolutely done it. Oh, and Matt and Rebekah Titus said the same thing. You're in the middle of it, and one person's like, "Are we arguing for the same thing? Dammit." Blaine: 09:35 Okay. What causes this? Dr. Jain: 09:37 Yeah, I think it could be a lot of things that cause it, but very often in those situations it's a difference in phrase more than a difference in meaning. So it's the difference between saying, "Six of one, half dozen of the other." But it's how it's said. It's what the person has said. It's maybe the way it just was received by the other person. And so they feel like they're fighting about something that's very different, and it becomes shocking in some ways, especially if you have a very close relationship and you feel that your values were very much the same. And then you have that disbelief. You have that shock. You're responding to all of that in the course of trying to have the conversation. And I think that can color a lot of what happens. So you find yourself escalating, getting angrier and angrier because you're like, "This is such a core, central point, and I can't believe that you would think that or you would think differently than me about it." And there's all these feelings that show up in it. And then I think at some point you're able to say, "Oh, wait. We actually are talking about the same thing," or, "I meant that first, and then I agree with you. I just think something has to happen first." Honey: 10:45 Right. I mean, I think literally you have said, "I can't believe you think ... " fill in the blank. Blaine: 10:53 I have. And you have often said, "I don't. I'm just yanking your chain." Honey: 10:54 Well, there's that. Dr. Jain: 10:55 There is that. But sometimes it's really about just the way it was presented and sometimes the language that was used. And everybody comes to conversations with different experiences of different words or different situations. So that always gets triggered first, and if it's something very important to you ... I can tell you a story of a couple. He ran a large trucking company and his wife stayed home and took over the home, watched the kids. So they weren't in business together, per se, but she did a lot to enable him to do what he had to do. And he had said that when their children became of a certain age, he wanted them to all work in the trucking company, and his idea was that they should start at the lowest jobs and they should, on their own merit, work up through the company. And she had a lot of family history, a lot of baggage, a lot of issues around that. So it really upset her that the son of the owner was sweeping the bays of the trucks or was doing dirty labor, whatever she called it. And they were fighting over the way that it was being enacted, but they actually agreed that their kids should have a work ethic and they should support the trucking company and grow up through it. But they were disagreeing on how it should be done. Blaine: 10:55 I'll bet they did. Dr. Jain: 12:56 They were like, "Oh, we've been discussing this for weeks. We've been fighting about it, and it really is just the difference between maybe putting that one son not in the bay to sweep but maybe having him, I don't know, empty the paper trash or something." I don't know. Something. Honey: 13:11 The mail room. Blaine: 13:12 Or at least give him a respirator. Honey: 13:13 They didn't hear each other. Dr. Jain: 13:19 Yeah, and you can't go to solutions because you don't know actually what you're fighting about. Dr. Jain: 13:23 And so that was an example of that. Blaine: 13:25 So let that be a lesson to you. If you have an ongoing argument, you might actually agree. So arguing is not necessarily bad. Blaine: 13:41 Do people have different arguing styles? Dr. Jain: 13:46 Oh, they absolutely do. They absolutely do. Blaine: 13:46 What are they? Can you highlight some of them, like the top three? Blaine: 13:46 The most popular ones. Blaine: 14:04 You can tell them what Honey is doing if you want. Blaine: 14:14 Thank you, [inaudible 00:14:15]. Honey: 14:26 You can stare at me [crosstalk 00:14:27] if you want. Dr. Jain: 14:26 ... "No, I felt this way, and this is how it feels, so it becomes real." I think also you have a style of arguing where people kitchen sink it where they start to bring up everything from the past. Dr. Jain: 14:40 So they have trouble keeping the argument to whatever it is today, but it's like, "Oh, you always," or, "You never," or, "Five years ago, you did this thing." Blaine: 14:49 10 years. Yeah, and they're bringing up something that happened at the wedding reception. Dr. Jain: 14:53 Absolutely. Absolutely. And then I think you can have somebody who also holds grudges, and so even if the argument's over and supposedly resolved, there's still a grudge that's being held so that it is brought up 10 years later or something like that. And so those aren't psychologically mandated. It's not like it's in the psychology literature, but those are the kinds of arguers that I've seen. Honey: 15:14 Yeah, and so what do you do when the styles are different? Dr. Jain: 15:19 Yeah, so the goal I think is to try and end up sitting on the same side of the table. And normally what that looks like is it's to help the fact-based people become more feeling oriented and the feeling-oriented people to become a little more fact based. And so a good thing to try sometimes is to try arguing for the other side. So if you're having an argument, like if you two are having an argument about something and Blaine is having a position and you, Honey, are also having a position, you could try swapping the positions and see how you would argue it. So if Blaine is saying, "No, I really think we need to stop working at 5:00 on Fridays," and you're like, "No, we should just see how it goes and it's fine," it would be interesting to have a discussion where you purposely say that you take his role, arguing for stopping work, and he takes your role, which is, "We can stop whenever." And it can give you a really good sense of the other person's perspective, which it can help you bridge that gap because really what we're talking about is it doesn't really matter what's right or wrong. It matters how you two as the couple can bridge that gap that you're having in what you're understanding or what you're wanting to do. And the techniques to do that is basically to trade perspectives, to increase the empathy, to try and see it from the other person's side, strategies or approaches like that. Blaine: 16:44 Yeah. Someone recently said to us, and I believe it was a CoupleCo interview, and I can't remember who. But had said, "Literally, sit on the same side of the table. Sit next to each other and try to argue, because it's much more difficult." Dr. Jain: 16:57 It is, absolutely. It actually is a technique. It's a technique that comes out of the couple's therapy work. Dr. Jain: 17:02 Dan Wile is a therapist, a psychologist, and he has couples in a couple's therapy session ... Normally, they're sitting maybe next to each other at a distance or one might be sitting in one chair and one might be sitting in another chair, and he'll have them turn to each other and talk like you're talking across the table. And when there is a issue that they can't seem to resolve, he'll actually have them physically move and sit next to each other and try to have the argument with them sitting right next to each other. And it changes everything because when you have distance between you, it's a lot easier to raise your voice. It's a lot easier to throw your arms up in the air. It's a lot easier to be dramatic. Blaine: 17:59 Two raging A-types. Dr. Jain: 18:00 Yeah, kind of like that or throwing their arms around and doing things like that. But for the couple where they want to try softening it or they want to just see what that's like to remember that they're allies and not adversaries, it can be a powerful thing to try. Blaine: 18:18 I love that. We can probably stop the interview right here and the takeaway would be phenomenal. Honey: 18:22 But we won't. Blaine: 18:22 But no, we're going to move on because ... and I'm wondering why Honey wrote this question down. What happens if one person shuts down? Blaine: 18:37 We know nothing about this. Dr. Jain: 18:57 Yeah, or they try to do a lot of disengaging. So you'll see sometimes people leave the room, and you'll see in high-conflict couples the other person will follow them and won't let them disengage. Dr. Jain: 19:08 They'll keep following them, and they'll keep trying to engage them again. And in the early attachment literature where they talk about how we create attachments to other people, typically what happens is if a person has married somebody who's a high engager, it's because they grew up in a home where their caregiver was a high engager. And so the good parts of that is that person is always there, and they're saying, "I'm here with you. I'm here with you. I want to connect. I'm here with you." The downsides of it though is that person doesn't know how to stop doing that when the time comes. And so if you are a person who disengages, you need to disengage, you need to leave, and your spouse or partner doesn't let you leave, you'll get overwhelmed and flooded. You may start to yell. You may not know what you're saying. You may just be overloaded, just I don't know what I'm going to say and just going off. And you may say things you really regret or things that are really hurtful that you legitimately don't remember because you're not processing information the way that you normally would. So flooding happens to everyone at some point, and it can happen if you're low on sleep, if you're at high stress, if you haven't eaten, if you've had too much caffeine. There's a lot of physical components to that sense of overwhelm and that sense of flooding. But when it does happen, it's really important for the person to try and communicate that they're flooded, and they need to take a break from the conversation and then for the person who can't disengage, for them to know when you're going to resume the conversation. So that would look something like, "I'm really overwhelmed right now. I can't continue to talk about this right now. I'm going to go for a run or I'm going to go outside or I'm going to leave the room, and I'd like to come back and we'll talk about this at 4:00." Dr. Jain: 21:13 ... because when you're flooded, you lose access to key parts of your brain that are involved in problem-solving, creating thinking, all those kinds of things, and you're having a lot of hormonal cascades that are happening in your body, so you can't pay attention and react and respond how you normally would. And so the thing is is that most of us probably wish that our spouse got flooded less often when we want to talk about something. So we always wish that they would just keep going with us until we were done and we were ready. But your relationship can only go as fast as the slowest person in it, and the person who is prone to overwhelm because of their own history, their own background, their own physiology, they're always going to be the one who has to control the rate of conflict or the speed of conflict, and that's just how it is. If you don't want to ruin the relationship and destroy it permanently, you can only ever resolve conflict as fast as the slowest person. Honey: 22:15 I feel like we need to pay you for a therapy session. Honey: 22:18 That was incredibly helpful. Blaine: 22:19 This has given us an answer to a question we were going to ask, which is, "Is it ever okay to walk away?" It's necessary to walk away for some people. It's the only reaction they can have to it. Dr. Jain: 22:30 Absolutely. And, in fact, one of the skills that you would learn in counseling or coaching around your relationship is how to identify when you're feeling flooded and how to mitigate it for yourself, if you can, but then also how to say that, "I can't stop this cascade. It's becoming too much. I can't stop it, so I can't be in this conversation," because then at that point you have to say, "Well, do you want to be right, or do you want to be in the relationship?" And sometimes you can't have both. Honey: 23:17 No, I'm not. Blaine: 23:18 Okay. So how can a couple learn to argue more productively? Honey: 23:23 See someone like you. Blaine: 23:25 Go see Rachna. Dr. Jain: 23:27 Yeah. I think something like that would be wise because ... I think we were talking about it. I don't know if it was here in this recording, but we were talking about the idea that sometimes you don't know what you don't know, so you can only take a conversation as far maybe as you've ever taken it before. And if that hasn't resolved it or solved it, you need some help to get over that speed bump or that hump to be able to talk about it the rest of the way. But, that being said, I think that some good techniques or strategies would be to build agreement. So you start by saying, "Here are all the things we agree upon in this particular situation," and creating that solid base of being allies. "We agree on 50 things, and we only are disagreeing on one or two." And if somebody can stop and do that, either for you or between the two of you, and can say that, "We agree on this and this and this and this and this and this, and we just disagree on item 11 and 12," it can help narrow the argument. I think if you both can talk around the argument where you say, "Well, what would agreement look like? Is it both of us saying we should open at 10:00 in the morning? Is that what we're trying to get to? Or is it that we just need to say maybe we need to open earlier than we do and earlier could be 10:30 or it could be 9:00 or it could be whatever?" So talking around the problem, so you're not trying to say the right answer is only opening your store at 10:00 but the answer is, "Well, what would be okay for Blaine? What would be okay for Honey?" And with that, what's important about the solution? So is it really about that the store has to open at 10:00, or is it that one of you is afraid that you're missing out on some business or somebody came by who criticized your store for not being open? So understanding what is the problem you're trying to solve, which I think I may have said before. And then I think looking at where you're finding points of agreement. "Okay, so we both agree that the store has to open earlier. Yes, we do. Now, we're just trying to figure out what time." Blaine: 25:32 What time. Yeah. Blaine: 25:33 Deeper history issues. Dr. Jain: 26:02 ... things that you bring because of your own history that might be difficult to talk about in that way. Blaine: 26:07 I think the deeper history issue we're facing is we didn't know we had a retail store, and we've not been opening it at all. Dr. Jain: 26:07 Yeah, exactly. Exactly. Blaine: 26:07 We're kind of screwed. Dr. Jain: 26:12 You're not opening at all. Right. Exactly. Honey: 26:16 Where's the store? Dr. Jain: 26:18 Exactly. But there have been couples who have whole arguments around something like what time should they open their retail location. Blaine: 26:36 We've muddled through, and it hasn't broken us. Honey: 26:38 No. So we went the long way around, but you start to see patterns. And it's like, "Oh, there's that pattern again." And so maybe you can diffuse it before it goes too too far because you can feel yourself leaning in that direction and you're like, "Oh, I recognize this. It's not about that." Blaine: 26:57 Maybe I shouldn't do this. Why don't I try saying this instead? Dr. Jain: 27:01 Right. And it gives you a chance to say, "Is this important enough to me to fight with my spouse over?" Honey: 27:06 And it almost never is. Yeah, it never is. It really never is. Dr. Jain: 27:10 Yeah, and for the most part, very few things are really, if we're really trying to piece out what is really important. Blaine: 27:26 It was a knockdown, drag out fight over punctuation. Honey: 27:28 We don't have a ton of loud arguments, but we did. It was big, and it was a comma. Honey: 27:35 I don't remember who thought ... and I would never argue for a comma, but I had just ... and I don't remember what else was going on in our lives, but I just remember I was in this place where it was like, "You know what? I'm not going down on this one." Blaine: 27:35 It's not about the comma. Honey: 27:46 It was not about the comma. Blaine: 27:46 And I don't even know what it was about. Honey: 27:49 It's never about the comma. Blaine: 27:50 But here's the other thing though is you're having that argument and you're adamant that you are right and you're sitting there and you're arguing for it and about halfway through you start thinking, "Oh, I'm completely wrong." Then what do you do? Honey: 28:42 ... say, "And that is incorrect." Blaine: 28:46 More than most people that I know, I probably am willing to utter the phrase, "I'm an idiot." But this might lead us to something that is useful. Is there anything you can do if you find yourself facing an argument to diffuse it before it starts? Is that even a good idea? Dr. Jain: 29:02 Yeah, I think you can, and I think it's similar to what you do when there's flooding. You just say, "Can we take a pause on this and can we come back to it at 5:00," or whatever time? Blaine: 29:13 Is it important to schedule it? Dr. Jain: 29:15 It is important to schedule it, especially if the other person has a high need to discuss it right then. They need to know when you're going to come back to it. You can't just say, "We'll discuss it later." Blaine: 29:25 "Oh, I can't meet you for that drink at 5:00 because I've got an argument scheduled with my wife." Dr. Jain: 29:32 I mean, it is crucial because if one of you has a high need to resolve it or a high need to engage around it, to be put off indefinitely, you're not getting what you need from that. I think that many arguments actually could be solved if we would just slow them down a little bit. They would be resolved before they start if we would slow them down a little bit, we would put a little bit of space in-between the immediacy of the argument and then having the argument. And then if we also each would take that time to check in with ourselves. Are we hungry? Are we tired? Do we need to close our eyes for 10 minutes? What do we need, and be able to attend to ourselves those ways first before we have the argument because many times it's depletion of resources. Blaine: 30:38 Or a Snickers bar. Dr. Jain: 30:39 Or a Snickers bar. Honey: 30:40 I was going to say the next time that I feel a disagreement coming on, I'm going to go in your office with a sandwich and say, "Here's the deal." I like that. Blaine: 30:49 A ham sandwich? Honey: 30:51 Would that make you happy? Honey: 30:52 Well, then, yes. A ham sandwich. Blaine: 30:54 A ham ... okay. We never have an argument without a ham sandwich on hand. Honey: 30:56 Now I feel like that's going to be our buzz word now. If we start getting in an argument and he's hungry, he's just going to say, "Ham sandwich," and then I'm going to know and it's going to diffuse everything. Dr. Jain: 31:05 Actually, my husband and I do that. Blaine: 31:07 Really? Ham sandwich? Honey: 31:09 [crosstalk 00:31:09] ham sandwich? Dr. Jain: 31:09 It's not a ham sandwich, but we actually do that. So what starts to happen is I have started to recognize that there's a particular way that he starts behaving when he's very, very hungry. He drives a long distance to get home, so very often in the evenings he's very tired and very hungry, and he'll come in, and he'll have a lot of energy and he'll be very energized and very activated. But there's this way that he's very activated but he's not really paying attention to what I'm saying. And so at first, I would get really angry. I would get very upset. I would rage at him and just be very distraught like, "How can you come home like this," and whatever. And he actually can't help it. When he gets hungry, it just is that way. Blaine: 31:09 And he'd go, "Uh oh. We're going to have an argument"? Dr. Jain: 32:27 ... and then I would say, "I have an idea, honey." I said, "We'll definitely talk about this because I know it's super important for you to talk about, but how about you have some cheese and crackers and just relax for a few minutes first and then we can go into this and we can talk about it?" Blaine: 32:42 I was actually just sitting here thinking, "What's it like for Mr. Dr. Rachna Jain to be in a relationship with a couples' therapist?" Blaine: 32:49 And she knows things. Dr. Jain: 32:55 Exactly. Because he'll say to me, "Do you really think that, or is that some psychology thing you're supposed to say?" And I just say, "Well, you may never know." Blaine: 33:09 Yes. On that note, I think we're going to have to let Dr. Rachna Jain get back to her practice. Dr. Jain of ProfitablePopularity.com and InLoveAndBiz.com. Should people go to InLoveAndBiz.com for anything ... ? Dr. Jain: 33:28 ... that will tell you how you're doing in your relationship. Dr. Jain: 33:31 It's free. Blaine: 33:31 It's a free relationship quiz. Honey: 33:32 Well, we haven't taken it. Dr. Jain: 33:33 You haven't taken it. It's at the bottom of the homepage. Honey: 33:40 We say everything else. Blaine: 33:42 Well, we're an open book. All right. Rachna, thank you very much. Dr. Jain: 33:45 Absolutely. Thank you. Honey: 33:46 Thank you so much. Dr. Jain: 33:46 Thank you. Blaine: 33:49 This concludes our conversation with Dr. Rachna Jain of InLoveAndBiz.com. Honey: 33:53 If you enjoyed this podcast and you think it would be useful or fun for other couple entrepreneurs, please go to iTunes and leave a star rating and a review to help them find it. Blaine: 34:02 And join us next time when we return to Park City, Utah, perhaps the nation's most challenging state with regard to liquor laws, for a conversation with Rob and Sara Sargent of Alpine Distilling. Honey: 34:13 This is a couple who understand how to face adversity. Blaine: 34:16 As residents of New Orleans, they lived through Hurricane Katrina, lost their home and virtually everything they owned and managed to take it all in stride. Honey: 34:25 Rob was born to be a distiller. He comes from a long line of Kentucky moonshiners. Blaine: 34:29 And Sara is not only a no-nonsense business woman. She's a killer athlete. But interestingly, there's no A-type energy going on here at all. Honey: 34:37 These are two of the mellowest, no-nonsense entrepreneurs you'll want to meet. Blaine: 34:42 And their product is excellent. Honey: 34:44 It is really excellent, and we know because we did our research. Blaine: 34:48 Yes. We drank a lot of it. 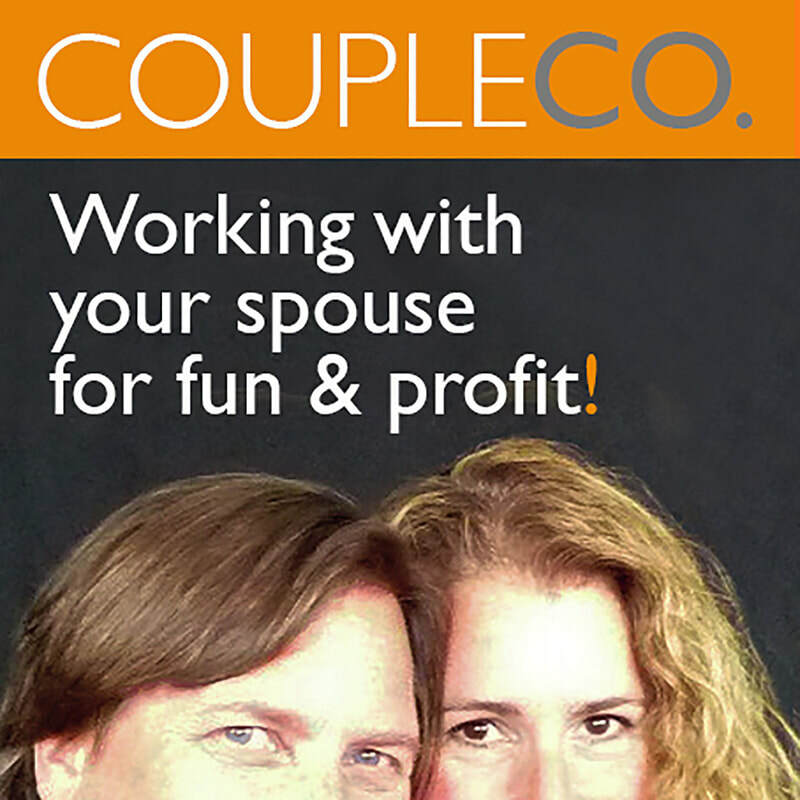 Rob and Sara Sargent of Alpine Distilling next time here on CoupleCo, Working with your Spouse for Fun and Profit. Honey: 34:55 Copyright 2018, all rights reserved. Blaine: 34:58 Love you, baby. Honey: 34:59 Love you, too.